Granite State Power Link is being proposed by National Grid and has bid into the Massachusetts Clean Energy RFP. 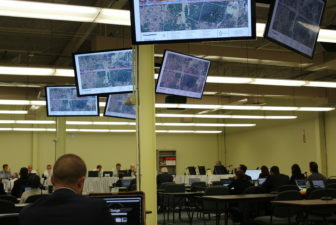 CONCORD – As the Northern Pass adjudicative hearings continued Thursday, InDepthNH.org obtained a new study that claims its competitor – National Grid’s Granite State Power Link – would be far better for the environment, a claim that Hydro-Quebec was quick to rebut. 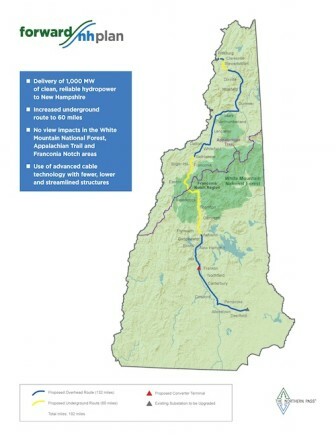 The study, which was commissioned by a subsidiary of National Grid, says the Granite State Power Link and its smaller project, the Northeast Renewable Link, would reduce tons more greenhouse gas emissions than what the Northern Pass Transmission bids into the Massachusetts Clean Energy RFP would reduce. The study, “Analysis of Greenhouse Gas Emissions Impacts: New Class I Resources vs. Existing Large Hydro,” was done by ESAI Power LLC, an independent energy research and consulting firm, at the request of GridAmerica Holdings, a subsidiary of National Grid. “Combined, GSPL and the NRL will enable approximately 1,700 MW of new wind and solar power in the United States and Canada, resulting in a 22.6 million ton reduction in global CO2 emissions over the first 10 years of operation, accounting for impacts across New England, New York and Ontario,” the study said. By contrast, Northern Pass and similar transmission projects that will deliver 700 mw of existing hydro and 300 mw of new wind generation would result in a 3.5 million ton reduction over the same period accounting for impacts across New England, New York and Ontario, the study said. “Additionally, lines carrying only existing or near-operation large-scale hydro would result in virtually no reductions in global CO2 emissions across the same area,” the study found. Joe Rossignoli, director of business development at National Grid, said the electricity generated by Hydro-Quebec that would be imported to southern New England over 192 miles of Northern Pass Transmission lines is already being generated and sent to New York and Ontario. “That doesn’t do anything for reducing greenhouse gas emissions because they are taking Hydro-Quebec power that is currently being delivered mostly to New York and Ontario and moving it to New England,” Rossignoli said. By doing that, there would be increased greenhouse gas emissions in New York and Ontario, offsetting the decrease to New England, so there would be no net reduction, Rossignoli said. Northern Pass spokesman Martin Murray said Hydro-Quebec would respond to questions about the study. Lynn St-Laurent, Hydro-Quebec’s spokesman, said ESAI’s analysis of the greenhouse gas emissions benefits of incremental hydropower imports via new transmission interconnections with Quebec is inaccurate. “Hydro-Quebec is concerned that National Grid’s commissioning of the ESAI report is motivated by the fact that they have a less competitive project in the (Mass RFP) process,” St-Laurent said. St-Laurent said the study’s claim that increasing the delivery of hydropower production from existing or near-operational facilities into New England has no environmental benefits shows a lack of knowledge of how the Hydro-Quebec system is operated. Co-developed by National Grid and Citizens Energy, Granite State Power Link would deliver up to 1,200 mw of wind power from Canada to Vermont. 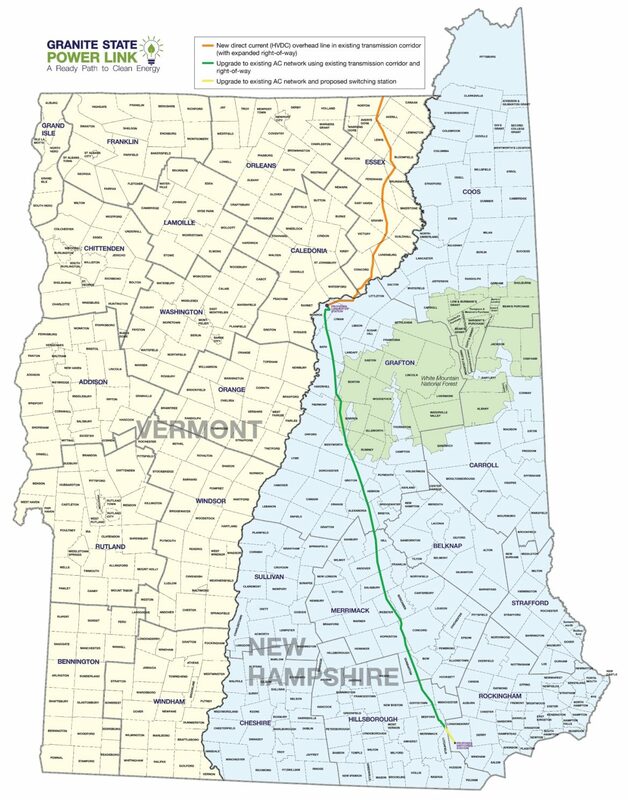 Staying within or adjacent to existing transmission corridors, GSPL would build approximately 59 miles of new direct current transmission line from a new converter station in northern Vermont to a new converter station in Monroe, NH, according to its website. “From Monroe, approximately 109 miles of upgraded existing AC (alternating current) transmission line will run to a new switching station in Londonderry, New Hampshire,” the website said. The Massachusetts Clean Energy RFP, will result in clean energy procurement of 9.45 TWh, or approximately 15 percent of Massachusetts’ total energy demand, over the next 20 years, the study said. Through a competitive bidding process, the electricity distribution companies in Massachusetts solicited long-term contracts for clean energy in March, received bids in July and are expected to decide January 27, 2018. National Grid and Northern Pass are both among the bidders in the Mass. RFP, which was initiated by legislation last year in the Bay State. Both have submitted two bids. Northern Pass submitted a bid that would include 1,090 of hydropower and another bid that would include hydro and wind power. Rossignoli said it is doubtful that both National Grid’s and Northern Pass’ bids would be selected. He also said there has been very little opposition to the GSPL, unlike Northern Pass that continues to stir controversy. The cost of GSPL is about $1.1 billion compared to Northern Pass’ $1.6 billion price tag. “We think this historic Massachusetts procurement opportunity should be used for the most benefit to the environment,” Rossignoli said. Northern Pass adjudicative hearing continued on Thursday in Concord and will go on tomorrow. At Thursday’s hearing, several intervenors continued cross-examining Robert W. Varney, a former Site Evaluation Committee chairman, who is now president of Normandeau Associates of Bedford and testifying for Northern Pass on orderly development. Attorney Christine Fillmore asked Varney about comments by Mary Parker Worthen about her home in Bristol and her plans to have a business that would host weddings. Varney said he was unaware of her plans. “When you look at the orderly development of a region, you look at a much broader scale rather than zeroing in on speculative future uses,” Varney said. Varney will continue testifying on Friday. In public testimony previously, Parker Worthen said Northern Pass is not in the public interest. The SEC holds adjudicative hearings to consider and weigh evidence. The applicant has the burden of proving by a preponderance of the evidence that a Certificate should be issued. Expert witnesses submit testimony under oath and are subject to cross-examination. Eversource had hoped to have all federal and state permits by the end of the year with construction to begin next year and the transmission line finished by the end of 2020. Members of the subcommittee that will decide Northern Pass by a majority vote are Chairman Martin Honigberg, PUC, presiding officer; Commissioner Kathryn Bailey, PUC; Dir. Craig Wright, Department of Environmental Services; Christopher Way, Department of Business and Economic Affairs; William Oldenburg, Department of Transportation; Patricia Weathersby, public member; and Rachel Dandeneau, alternate public member.